Kirvin Moesquit was 3-for-3 with a walk, stolen base, and an inside the park home run. 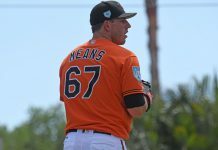 He played second base and as a complete offensive force is the Orioles Hangout MiLB of the day. Just call him Rickey. Drew Dosch was 2-for-4 with a double. Joey Rickard was 2-for-2 with two walks. He doubled. Austin Hays was 2-for-4 with a home run. Ryan McKenna went 2-for-3 with a double and a walk. He’s having a fantastic season. Jake Ring had a single and three walks. Brenan Hanifee very pitched well again, one earned runs in seven innings. He struck out five and walked one.